Hessel, Ingo. "Parr". The Canadian Encyclopedia, 24 March 2017, Historica Canada. https://www.thecanadianencyclopedia.ca/en/article/parr. Accessed 24 April 2019. Filled with animals and hunters and drawn in a distinctive, direct style, with little regard for naturalism or perspective, Parr's naive images are powerful expressions of an old man's love for a disappearing way of life. Graphite on paper by Parr, Cape Dorset (University of Lethbridge Art Collection). Parr, Inuit graphic artist, hunter (born 1893 on southern Baffin Island; died 3 November 1969 in Cape Dorset, NWT). Filled with animals and hunters and drawn in a distinctive, direct style, with little regard for naturalism or perspective, Parr's naive images are powerful expressions of an old man's love for a disappearing way of life. Parr led a traditional nomadic existence with his wife Eleeshuse for most of his life; they had nine children together, several of whom themselves became artists. A serious hunting accident obliged him to settle permanently in Cape Dorset in 1961. In 1960, Terrence Ryan, a young art student trained at the Ontario College of Art, encouraged him to take up drawing, so he began to draw at age 68. He progressed from graphite pencils to coloured pencils and felt-tip pens. In his short artistic career, he produced over 2,000 drawings and contributed 34 prints to the annual Cape Dorset print collections. 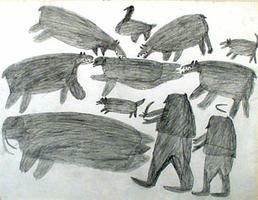 In one untitled drawing from 1962, a walrus, two seals and a fox leap horizontally across an otherwise blank page, as geese stand behind them. In the now famous Walrus Hunt (1963), three hunters rendered in blurry silhouette, one holding what looks like a rudimentary telescope, are moving in the same direction, hands outstretched. Unlike most other Inuit artists, Parr had little interest in illustrating Inuit legends or myths; all of his drawings are of animals and hunters. The drawings of Parr, who was born in the 19th century, offer a unique perspective on the lives of Inuit men at a time when the impact of Europeans on Inuit life would have been minimal. Often considered crude and childish, Parr’s works were largely unappreciated during his lifetime. Only after his death were there major exhibitions of his work, and a posthumously published print, Hunters of Old, was selected for a 1977 Canadian postage stamp. There have been two solo exhibitions of Parr’s work: Parr: His Drawings, curated by Marion E. Jackson at the Mount Saint Vincent University in Halifax, Nova Scotia in 1988, and Pencil to Paper: Early Drawings by Parr at the National Gallery of Canada in Ottawa, Ontario in 1997. 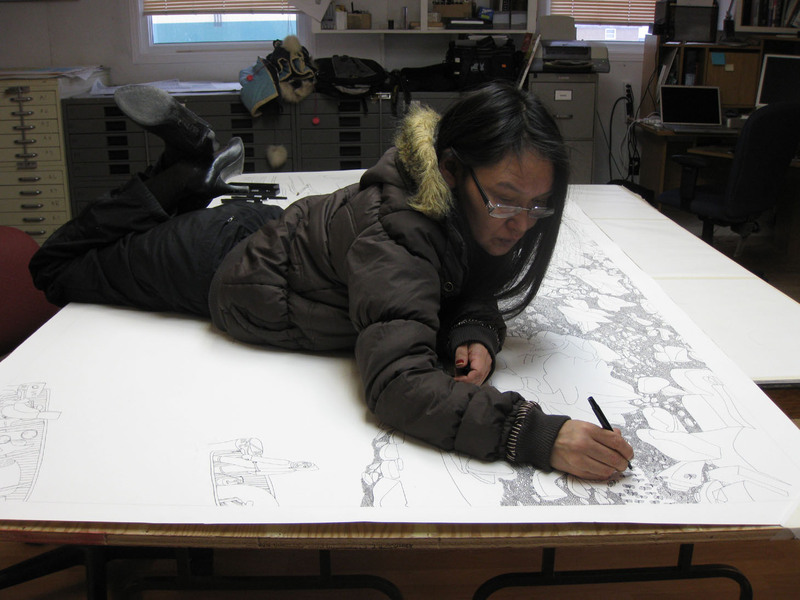 His work has also been included in group exhibitions of Inuit drawings and prints in Canada and abroad.